Are the Materials in My Home’s Construction Good? You are here: Home » » For the Buyer » Are the Materials in My Home’s Construction Good? The pieces that make up your home may be of great quality when the builder bought them, but there may be a problem with them by the time the builder installs them due to weatherization. I was inspecting a home this weekend where the builder had rushed building several homes at once, and they were not too fussy about material quality. They did try to make the home look nice. I am not too bothered with using a standard appliance or piece of wood; I care more about construction quality. However, there are times that I do become concerned with the quality of the good being used. This problem becomes more acute with engineered wood products and how they are handled on the job site. Last night I was over at a relative’s house with nothing to do. The children were playing; the wives were discussing sewing fabrics for furniture; and I was alone. I decided to head out to a construction site that had been abandoned a year ago, but I had passed by when heading to an inspection recently. I saw that a crew had been on the scene, and I was wondering what they were working on. This site caught my attention, because of roof trusses and wall coverings that had been sitting out in the open. A roof truss is an engineered system that can take the load of the roof and distribute it to the walls while allowing more space beneath. 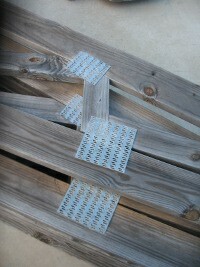 These are being used on homes, but most of us have a home with rafters and joists for the framing. A truss relies on the load (weight) being distributed throughout its members in specific means. This allows for smaller lumber pieces to be used than the rafter and joist method, but everything in the truss has to be in good shape for the system to work well. Look at the picture below, and see what strikes you as odd. These boards have been left out in the rain for at least a year. Hopefully, they will not be used. They do have a trash container there, but it looked like the builders were looking at the possibility of using the trusses. We may find it obvious not to use such weatherized trusses, but when you are trying to save money, you may consider going with inadequate material. I am sure that they will not use them; they are in too bad of shape. There are cases which are not too obvious. Laminated wood products are quite common in the construction industry. This is a great development, since we are using wood effectively. The problem these products face is mishandling. An engineered laminated header or oriented strand board cannot be left out in the rain. For that matter, any piece of framing lumber should not be left out in the rain. A little rain may not be a problem. The problem arises when the water effects the framing member. During phase inspections (inspecting a home during its construction phases), I have seen builders use these products once they have been out in the rain. Leaving an engineered wood product may not have caused a concern. I look for weaknesses which may have arisen from this situation. Are pieces delaminating from the product? Can I find any other weakness, such as soft spots? Has the integrity been effected in any way? If I do find an issue, the piece may still be used. It depends upon the piece, and the amount of damage. Typically, this becomes the provenance of structural engineers. Like I said, each engineered, or even non-engineered, wood product is designed to deal with certain weight or installations, and this is where the structural engineer can tell you if the integrity has been maintained. Although I do phase inspections, I do not always suggest to clients that they need them. In many Texas counties, there is a requirement that homes be inspected several times during the building process. I do suggest having your own home inspector for the final inspection though. Your own home inspector will be more detailed in his report, and the inspector will be more responsive to you. Once the wall coverings go up, issues with weathered framing pieces cannot be seen. This entry was posted on Monday, August 30th, 2010 at 11:45 am	and is filed under For the Buyer. You can follow any responses to this entry through the RSS 2.0 feed.